Before Elvenar came into action, Innogames first developed the Forge of Empires. It is another epic empire-building strategy game that is seemingly inspired by Innogames’ Tribal Wars, their very first game that was launched way back in 2003. The goal in the game is simple, develop your city through ages and build yourself a strong and sustainable empire. It basically works the same way with other popular city-management games such as Clash of Clans and SimCity but still offers some distinctive elements that separate FOE (Forge of Empires) from other games that fall into the same category. As a city management game, Forge of Empires will take you to two different phases; the building phase where you construct buildings and gather valuable resources and the battle phase where you conquer nearby territories. Quests are the most essential part of this game as they are the only way to progress. Players will earn rewards in the form of virtual currency, resources, and diamonds. It is also your responsibility to expand your village into a powerful community and also to keep your people happy and satisfied. Possibly one of the most distinctive features of FOE is the battle system. It features turn-based combat similar to classic role-playing games. Normally, for a city-management game, the battle system is performed automatically. You enter the battlefield and your army’s attributes usually dictate your fate. 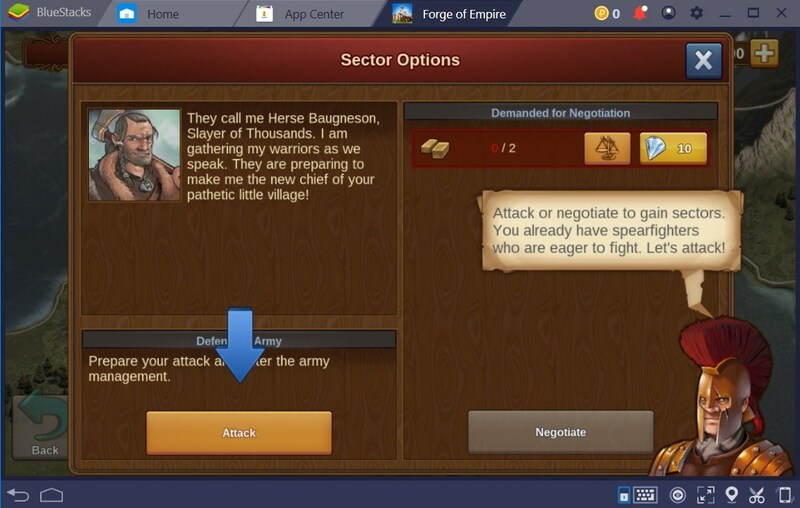 In Forge of Empires, however, your warriors will fight individually. You move each character strategically and manually approach the enemy on the battlefield. If all enemies have been killed, the battle is considered a victory. Tribal Wars focuses on Middle Age while Elvenar takes you to the mystical world of elves. Forge of Empires, on the other hand, takes you to not just one but several periods of history. Your journey will start to take place a million years ago in the Stone Age era. You’ll begin with a small village with basic structures like Town Hall. As the game begins, you will be asked to construct residential buildings to increase your village population. Goods and Production buildings will be added in order to gather resources and supplies to make your empire more sustainable. Located on the uppermost portion of the game screen are icons and figures to indicate your empire’s current status. Population: Indicates the number of people currently residing in your empire. In order to accommodate more people, you must construct more residential buildings or better yet upgrade them to increase their respective value. Happy Meter: This gauge will indicate how happy or how enthusiastic your people are. It is very important to keep your population happy in order to increase your empire’s overall production value. You must construct Cultural buildings or add Decoration to keep the people happy and satisfied. Forge Points: Forge Points play an important role in this game. Forge points are mainly used for conducting Research which allows you to unlock more buildings. They are also used to level up Great buildings and to trade goods in the Marketplace. Interestingly, the Forge Point meter has a maximum of 10 consumable Forge points. The Forge Point meter will automatically refill at the rate of 1 Forge Point per Hour. Therefore, you have 10 hours to get the entire bar filled. There are many ways to earn Forge Points aside from waiting and we will discuss them in detail in the Fast Progression Guide. Coins: The basic currency of the game which you can earn by collecting them from residential buildings. Coins have many important functions. They are used to upgrade buildings, train troops and also to produce goods. Supplies: They are also one of the main currencies in Forge of Empires which play a crucial role in upgrading buildings, conducting research, training troops and more. You need to construct Production buildings to earn them. Diamonds: Diamonds are the premium currency in this game. You can earn them through quests, special events or through the in-game shop. You can buy premium buildings and items through diamonds. They can also be used to expedite the process of production. From the Stone Age, you will eventually venture to a different era. The buildings will also adapt from these changes and you will be asked to expand your territory. After the Stone Age, you will soon enter the Bronze Age Era followed by the Iron Age period until you have reached modern times. In fact, you will even explore the distant future where technologies like robots and other futuristic elements are greatly present. Unlike typical empire building games, Forge of Empires will strongly encourage the players to establish the most effective strategy to maximize their chances of winning. The battle will not mainly rely on your troops’ attributes. In order to enter the battlefield, you must enter the World Map. Here, it features your territory and all the nearby provinces and continents that you can acquire. From the continent map, simply tap the telescope icon to examine the area. Here, you will encounter various troops and you can deal with them in two ways. You can either Negotiate or initiate an Attack. In Negotiating, the opposing party will ask for a certain amount of goods. Giving them so allows you to acquire the area in a diplomatic way. If you choose to attack, it prompts you right away to the battlefield. The battlefield will be shown in grids (image shown above). You can deploy a maximum of 8 troops in the battle and engage in a turn-based PvE combat. As the battle starts, you manually position each troop on the battlefield and place them adjacent to the enemy in order to execute an attack. Be mindful that each type of troop comes with their own strengths and weaknesses. A successful battle allows you to earn rewards in the form of coins, goods, and supplies. If all sectors of a province were defeated, you will be able to acquire the province and expand your overall territory. 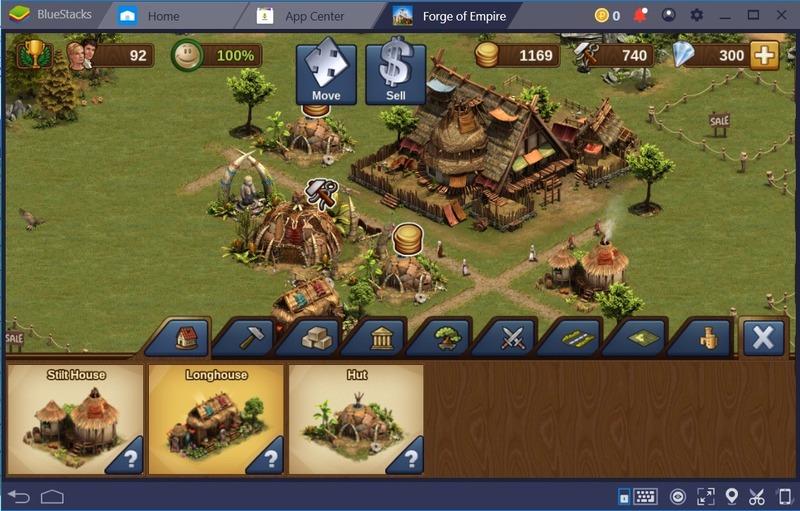 It is very interesting to note that Forge of Empires is currently made available for three different platforms. You can download the game on your iOS or Android devices or you can play the game on its browser version. It even provides cross-platform access for both mobile and browser platforms. Interestingly, you can also fully embrace all the game’s impressive features through BlueStacks 4. 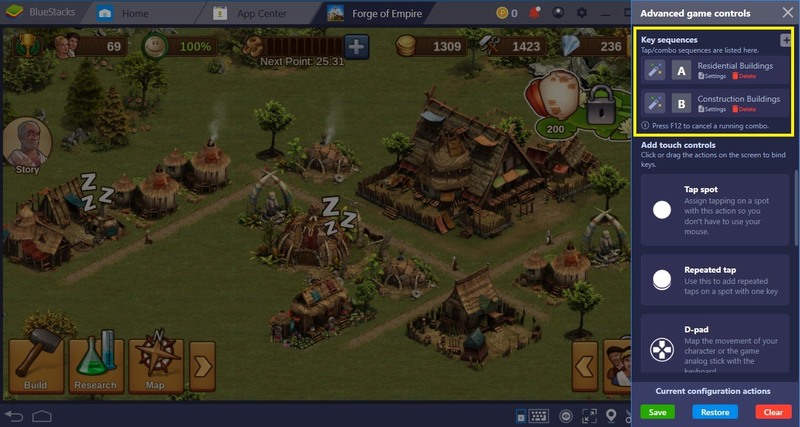 In fact, BlueStacks 4 will provide you a full gaming experience that makes you enjoy Forge of Empires even more. Allow us to explain why. Forge of Empires is already a visually stunning game. It is adorned with impressive visuals and remarkable music to set the mood perfectly. However, this quality and the performance of the game will still vary depending on the model of your device. Players with Low-end phones tend to experience lag issues in the process. With BlueStacks 4, you’ll get a performance that is 6 times faster than the latest Samsung Galaxy S9+. 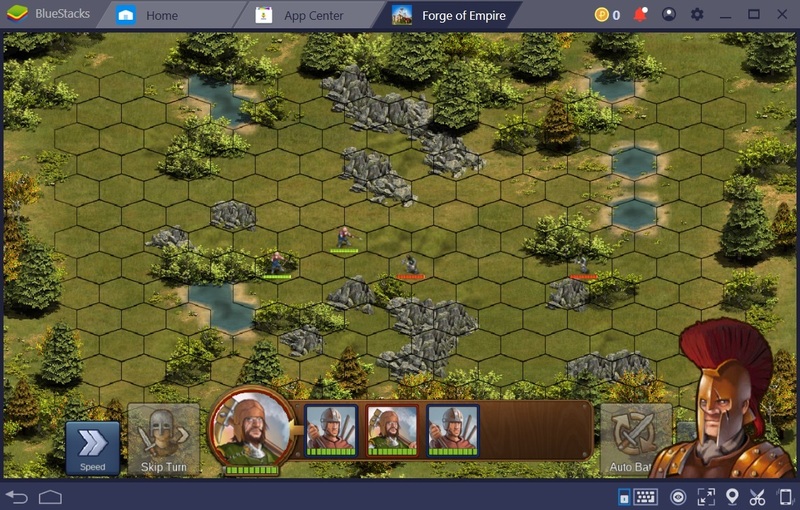 Powered by Android 7.1.2 (Nougat), you can run any game like Forge of Empires with uncompromising graphics and incredibly smooth gameplay. 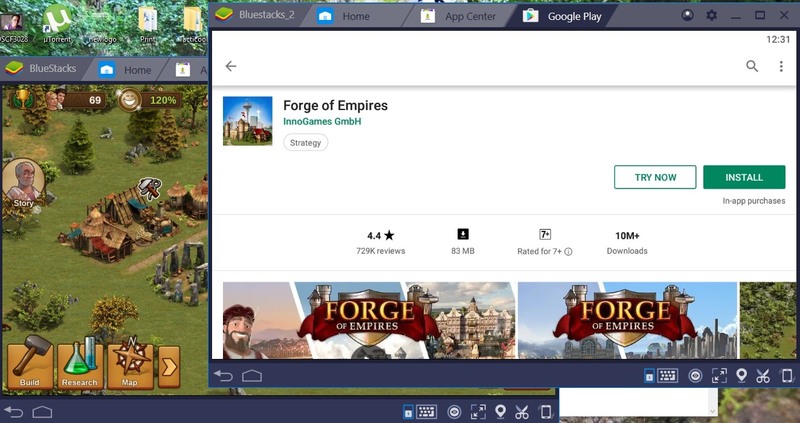 BlueStacks 4 is more than just your typical Android emulator. It is loaded with impressive features to help you maximize your gaming experience. One of which is the Combo Key Function. This particular BlueStack 4 feature allows you to record all your actions and perform them repeatedly using a single hotkey. 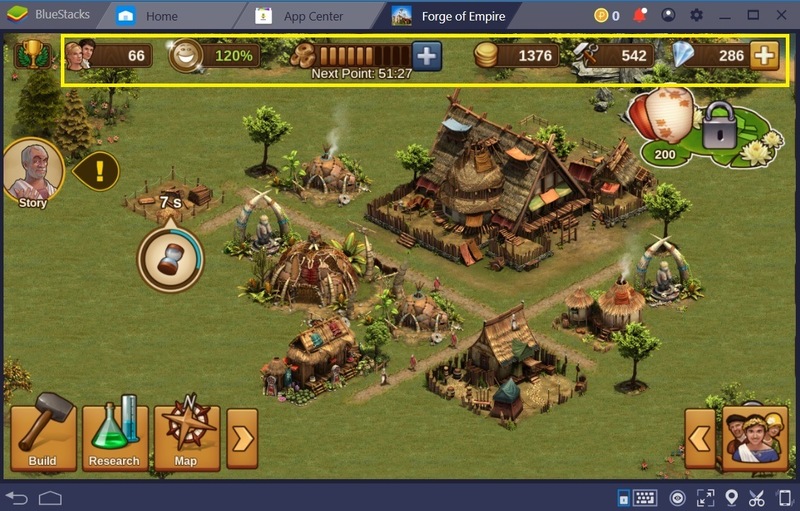 So how can you take advantage of this feature with Forge of Empires? Collecting coins and supplies can be very time consuming especially if you managed to transform your simple village into a Metropolis. You have to manually click all the buildings to collect all the resources. With the Combo Key function, you can collect all these items by pressing a single key. To do so, simply click on the Advanced Game Controls icon (keyboard icon on the lower task bar). This will open a separate panel on the right. Look for the “Key Sequences” and click on the plus (+) icon on the upper right. This will display a new set of buttons. Just click on the “Start” button to start recording your actions. We highly suggest doing a separate recording for Residential and Production buildings. Once done, hit the Stop button and assign a name and hotkey to it. 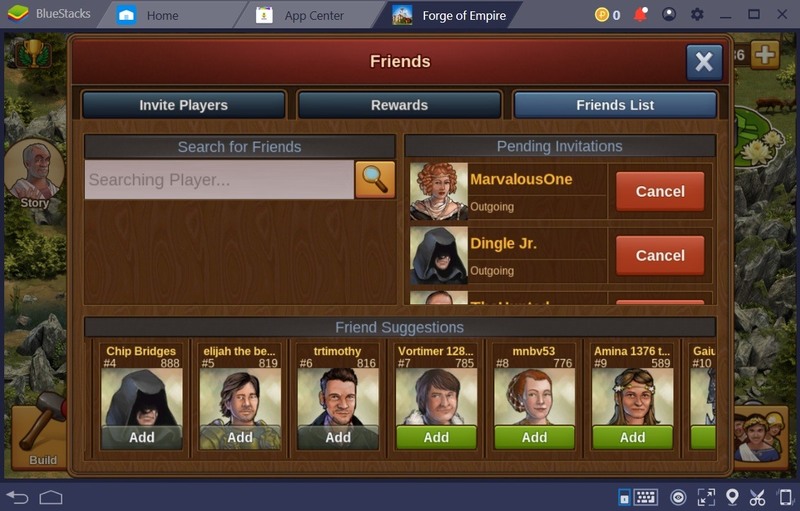 Since Forge of Empires features a Guild system and a lot of other Multiplayer functions, you can definitely use BlueStacks 4 Multi-Instance feature for your own advantage. The Tavern system, for example, requires you to invite online players in order to collect Tavern Silver. With Multi-Instance, you can create a separate account on a separate BlueStacks window. You can either use such account as a dummy or a real one. Using your main account, you can instantly add the newly created account on your friend list. This will automatically fill a slot on your tavern without waiting for other player’s “Friend request” approval. This feature is also advantageous when it comes to building a guild and on Guild expeditions. 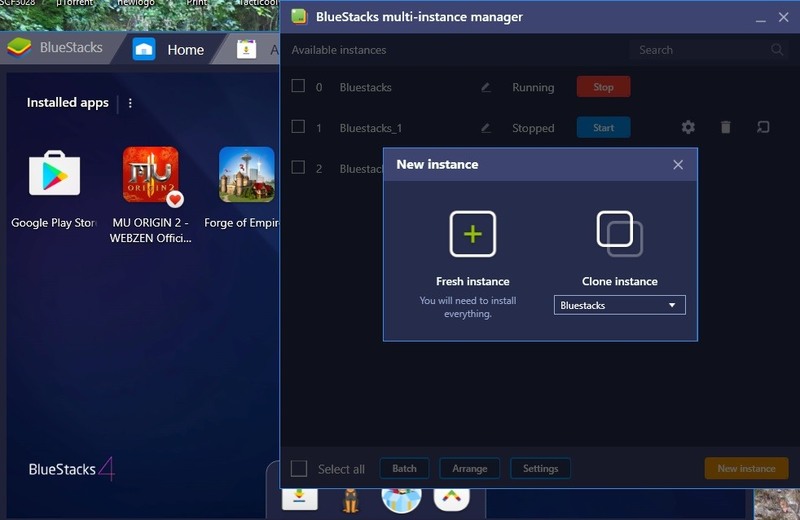 To create a new instance, simply head over to the Bluestacks Menu page (hit the Home tab on the upper left corner). Look for the My Apps icon and select the Multi-Instance. It will open a separate panel asking you if you want to create a Fresh Instance or a Clone Instance. Select Fresh Instance and this will open a separate BlueStacks window. Download the Forge of Empire app from the Playstore and start linking it to your main account. Forge of Empires has so many areas to explore. It has remarkable longevity which is very common to any Empire building games. Other noteworthy features of FOE include the epic Guild Vs Guild combat where guilds will engage on battles to fight for territories. There are also Guild Expeditions and Special events that allow you to earn special and limited-edition prizes. You will also encounter questlines that will focus on real historical figures from Christopher Columbus to Genghis Khan and more. So go ahead and embark yourself on an epic journey. Travel through time and build your empire through various ages and experience victory by conquering territories. Download Forge of Empires and play it on BlueStacks 4 and let your adventure begin!